Lübeck is a small Hanseatic town on an island enclosed by the river Trave in the northern part of Germany. It is not that far from Berlin and very close to Hamburg. With its brick Gothic architecture it oozes history on every corner. If you like everything to do with shopping (this town is an excellent place to learn about trade), the ocean, adventure, travelling, stories about seafaring nations, and marzipan of the very best quality there is, do yourself a favour and visit Lübeck. Looking at the town from above, you see a sea of red brick and green copper roofs under a wide open sky. There aren’t any skyscrapers or tall buildings, other than church towers to block your view. Lübeck became a wealthy town over the centuries. It was an important gateway for Germans, who were able to do business with merchants as far away as Russia and Persia. The space on the island became limited. In parts of the town landlords erected corridors and courtyards between their properties to use available space to its full extent and create income from the rent. More and more shacks were built as a home for labourers and the old folks of the town. Times have changed a lot, whereas living conditions were not too rosy through these days, today these small houses are popular for their very special flair. Sydney has the Opera House, Paris has the Eiffel Tower, Berlin has the Brandenburg Gate, San Francisco has the Golden Gate Bridge and Lübeck has the Holsten Gate. The gate was built between 1464-1478, the swampy ground proved to be unstable, and the gate leans to one side until today. The famous landmark welcomes visitors to the city with the inscription "Concordia domi foris pax," which can be translated as "Harmony inside, outside peace". The Aegidien Church lies in the middle of the former craftsman/artisan district. The church was first mentioned in 1227. Since this is a rather small church I had the feeling that the guard was more than happy to have a chat, there weren’t too many other visitors. She showed me the Gothic wall paintings in the choir and the baptismal font from 1453. Info. Opening hours: Tuesday to Saturday 10am to 4pm. Entrance is free. Henry the Lion, the powerful prince of the Welf dynasty laid the cornerstone of this cathedral. 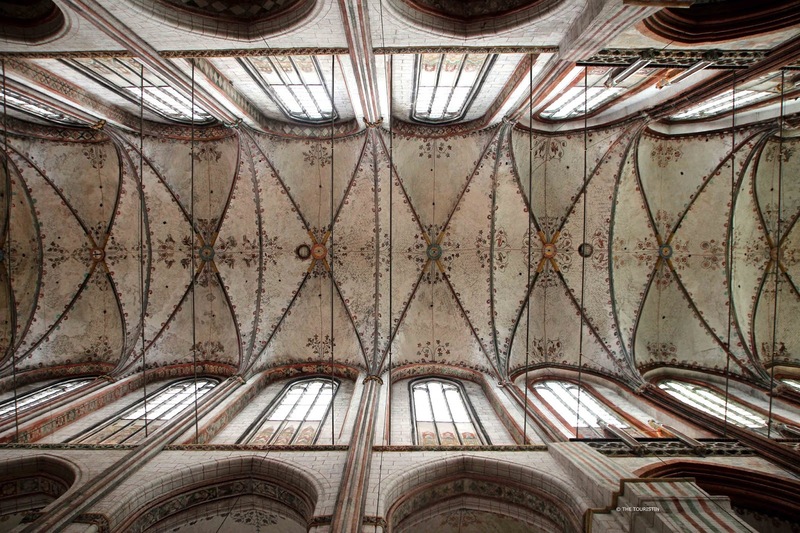 The construction began in 1173, and that makes the Lübeck Cathedral the first brick church in the Baltic region. The Cathedral contains several medieval altars and there are also grave stones and sarcophagi of bishops in the chapels on the side. Most impressive is the Astronomical Clock. Info Luebeck Cathedral. Opening hours: April to October. 10am to 6pm. October 10am to 5pm. November to March 10am to 4pm. Entrance is free. Not far from the Holsten Gate by the river Trave is a group of six Renaissance and Baroque gabled brick warehouses which were built between 1580 and 1745 to store salt from the nearby town of Lueneburg. The salt was exported to Scandinavian countries, where merchants used the precious commodity to conserve fish. The houses by the river seemingly carry each other through time, and if you remove one, they might topple over and fall into the river Trave. The two towers of the brick gothic St Mary's church, built between 1250 and 1350, stick more than 120 meters into the sky. With a height of 38.5 meters in the nave, St Mary's is (to date) the highest brick vault in the world. I mentioned earlier the air raid, and also St. Mary's Church was almost completely destroyed on that night. You can look at the original bells which had fallen down from the tower, they have been in this exact spot ever since. Info St Mary's Church: Koberg. Opening hours Tuesday to Sunday 10am – 5pm. Entrance fee: EUR 2. Make your way to Mengstrasse 4, and you will find yourself in the heart of the first German-language social novel. "Buddenbrooks: The Decline of a Family". It took the author Thomas Mann three years to describe a wealthy merchant family over four generations. The author used his own family history as a template for his successful novel. And in 1929 he received the Nobel Prize for Literature for his vivid illustration of the Hanseatic bourgeoisie. Not only had the fictional family lived behind the Baroque facade of the Buddenbrook house, also Thomas Mann himself. Walk through the permanent exhibition to learn about the author's family, to see how the book became published, and visit scenes of the novel. You can grab the book, and read paragraphs in the exact room the scenes are set. Info Buddenbrookhaus. Mengstrasse 4. Opening hours Monday to Sunday 10am to 6pm. Adults EUR 9. The Niederegger marzipan from Lübeck, the town is often called "marzipan city" is best to be described as, I usually don't use words like this, world class. It is moist, the sweetness is subtle, and the flavour of the almonds lightly explode in your mouth. The already in the 16th century produced marzipan was at first reserved for the nobility, and only in the 18th century it became available in patisseries for sale to the general public. I can say that, without the slightest doubt, Niederegger is the epitome of marzipan in Germany. The secret recipe of the Niederegger marzipan has been passed on from generation to generation. When you visit the Marzipan Salon, a museum above the store and Café, the only thing you find out is that the company uses Mediterranean almonds together with sugar. The almonds are doused with boiling water so that they swell slightly and the skin can be readily removed. When they are well dried, they get finely ground (maybe the secret lies in for how long?). The almond meal needs to be mixed with icing sugar and rosewater or other aroma until the mixture binds. Browse the store to buy different varieties of marzipan, and visit the café to try the Marzipan Nut Cake. Marzipan paradise found. Info Niederegger. Breite Strasse 89. Opening hours: During the week 9am to 7pm. On weekends: 9am to 6pm. Free entrance. In 1286 this property was built as one of the first social institutions in Europe. The wealthy citizens of Lübeck meant well with constructing this brick gothic hospital and creating a refuge for 100 sick and elderly people. At first their beds were separated by curtains but in the early 19th century they turned each space into small chambers made of wood. In the 1970s inhabitants were transferred into facilities of a modern nursing home. Visit this place to see the wooden chambers in their original state. Info Holy Spirit Hospital. Koberg. Opening hours Tuesday to Sunday 10am – 5pm. Free entrance. Go for a walk along the river Trave towards the northwestern end of town to reach this small museum harbour. The vintage ships are of the past 150 years. This is the church of the fishermen, deck-hands, commanders, and today also the home of the National Memorial to the civil seafarers. It is a gathering place for seafarers from all over the world. The beginnings of the church date back to the 1220s. Look at the impressive altar from the early 16th century and the organ, a Stellwagen which apparently is one of the most important organs in Europe. Take a closer look at the flue pipes, they are all painted with golden faces. Info Jakobi Church. Jakobikirchof 3. 23552 Lübeck. Free entrance. Ever since 1535 this property has been a meeting place for seafarers. 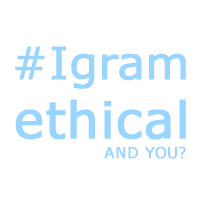 The brotherhood has been founded to help and comfort the living and the dead, and all, who are willing to make an honourable income in seafaring. The society of seafarers looked after ship passes, boat taxes, legal matters and also took on mediation tasks. Until today a statute regulates that a member of the society of seafarers can only be who has the full captain's/commander's-license. Applicants must demonstrate that they led a ship, for whose guidance the aforementioned licence is obligatory and live in Lübeck or the surrounding area. This has got nothing to do with a theme park or anything, this is the real deal, and not much has been changed in here, if anything. This has been a place where commanders had their word in who can board their vessels and hence decided over the success of trade with other nations. The traditional hall is leased to a restaurateur and open to the public. You can feast on German food. Sit at long wooden benches, look at the paintings and all these fantastic ship models dangling from the high wooden ceiling, and dream of travelling. It gets especially cosy when they light the real candles of the antique chandeliers. There is also a story behind the street name. The Engelsgrube is first mentioned in 1259 with the Latin names Fossa Angelica and Platea Anglica (England Street). The name refers to the part of the port to which the road led. This is where commercial vessels docked which were operating in foreign trade with England. Info Seafarers Society (Schiffergesellschaft in German). Engelsgrube 1. Opening hours: 10am – 11pm. As I said in the beginning, Lübeck is a tiny town, and as you now know it is full of stories and there is lots of history to discover. Everything in the old town can be reached by feet. Best: Eat enough marzipan and Marzipan Torte to have enough power for your sightseeing adventures. Would you like to travel to other places in Germany? Travel Germany. Street Art, abandoned places andcoffee in Leipzig, Saxony. Travel Germany. Chorin Abbey in Brandenburg. Travel Germany. Visit the town of Ribbeck, Havelland region in Brandenburg. Travel Germany in winter. Visit the Alte Pinakothek in Munich. Norderney: 20 things to do on an island in the North Sea. 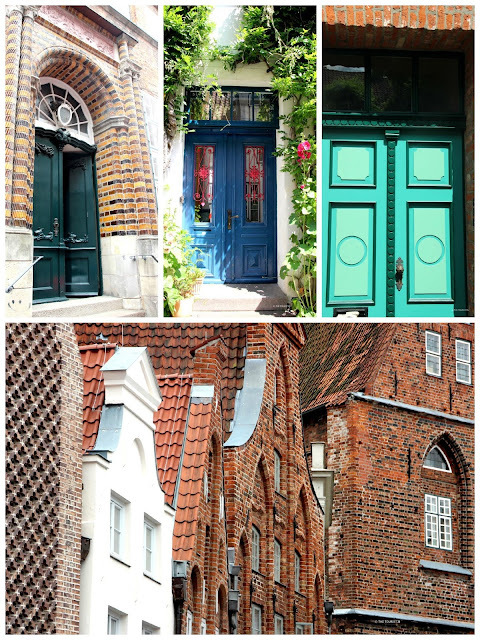 I absolutely love reading blog posts about charming towns and villages just like Lubeck that I had never previously even heard of. I love the look of the architecture and churches and would totally love to visit the marzipan salon or have a slice of the marzipan torte! Thank you for introducing me to this town! Hi Shikha, thanks so much for your comment. Isn't it most amazing how many little gems are out there in our world? We just need to find them. The marzipan torte is super yummy, and who knows, you might visit Luebeck one day and try it.